Air plants (Tillandsia) are supposed to be some of the easiest plants to keep alive, indoors. For starters, they don’t even need soil, absorbing water and nutrients through scales on their leaves. But just like succulents, and orchids, some people have trouble keeping them alive. I know because y’all tell me. I also know because I see a lot of browning air plants that are clearly dying of thirst. I also see far too many holed up in closed terrariums—not a match for the circulation-loving plants. So let’s get to it. I know you thought you’d be fine just spritzing your tilly every few days , but that isn’t enough. I’m known as the air plant whisperer around these parts, and this is what I do: Once a week, I dunk them in a container large enough to fully submerge them and let them sit there. For hours. I always intend to follow the advice Airplant Man gave me to soak them overnight. But sometimes it’s Friday (I keep mine at work and don’t see them on the weekends), so I do it for a few hours. It varies, but a several-hour dunking once a week has killed none, and they’re all thriving. After they soak, they need to dry out fully. Fully! Shake off any excess water and put them in a bright spot for at least 4 hours. This is key, as dampness is the main foe of an air plant. Bright filtered or indirect light is ideal for indoor air plants. Some direct sun works, too (morning is better), but they shouldn’t be baking all day. For amazing looking plants that earn you bragging rights, feed your plants once a month by adding fertilizer to the water mix. Use a bromeliad mix (air plants are in the bromeliad family), and don’t overdo it—plants can burn from too much fertilizer. The good news here is that you have to work pretty hard to mess this one up. Air plants are happy with a wide range of temps, from the 50s to the 90s. Just know that the hotter and drier the air, the more often you’ll have to water. Also—they’ll bite the dust in freezing temps. I know, I know—glass terrariums are adorable, but air plants need air circulation. An enclosed vessel encourages wet, stagnant conditions, and this spells disaster. If you just can’t get over glass, choose a vessel with as wide a hole as possible, and be sure to let plants dry fully before you place them back inside. Want more info? 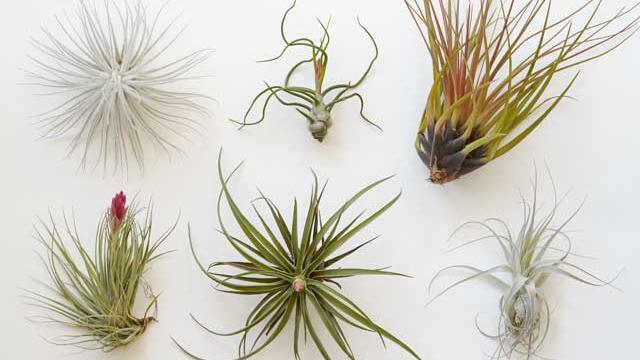 Get yourself a copy of Air Plants: The Curious World of Tillandsias. There’s no other book like it.